This Monday, January 21, with the Electronic Verification Code (CVE) 1530935, the Official Gazette published the decree creating the Marine Park (PM) Islas Diego Ramírez and Paso Drake. The new regulations were based on technical report No. 220/2017 of the Undersecretariat of Fisheries and Aquaculture, which, in turn, was based on the proposal of the University of Magallanes and the Institute of Ecology and Biodiversity of the University of Chile, in partnership with the University of North Texas and other national and foreign institutions, which have joined the Subantarctic Biocultural Conservation Program. According to the researchers who participated in its elaboration, it emerged from a vision that integrates science, education and conservation in the sustainable development process of the austral end, consistent with the view promoted by UNESCO, an organization that declared the area a Biosphere Reserve Cape Horn in 2005. According to the Vice-Rector for Research and Graduate Studies of the University of Magallanes, Dr. Andrés Mansilla, with this milestone "Chile is positioned worldwide in the conservation of the ocean; It complies with the commitments made by the Government of Chile worldwide, and protects its marine continental shelf, something that has remained invisible for many years and that, unlike other countries, Chile must address with the utmost urgency." 1. That it is the duty of the State to protect the preservation of nature, as well as to ensure the protection and conservation of the country's biological diversity. 2. That marine parks are protected areas destined to preserve ecological units of interest for science and to protect areas that ensure the maintenance and diversity of hydrobiological species, as well as those associated with their habitat. 3. That the Diego Ramírez and Paso Drake Marine Park is located in the Diego Ramírez archipelago and the Drake Passage, in the Region of Magallanes and Chilean Antarctic, with an approximate area of ​​144,390.6 km². 4. That the southern tip of western South America has been identified worldwide as one of the last pristine regions, whose geographic isolation and especially dangerous waters for navigation have meant that this area has had low direct human impact, scarce presence of species exotic and no invasive alien species have been recorded. In its article three, the decree identifies as Conservation Objects "the ecosystem and marine biodiversity of the Archipelago Islas Diego Ramírez; the continental slope; the seamounts (Monte Sars, among others); the brown macroalgae forests, composed of Macrocytis pyrifera and Durvillaea antarctica, species of the genera Lessonia spp. and Desmarestia spp. ; the feeding and nesting areas of the black-browed albatross (Thalassarche melanophris) and the gray-browed albatross (Thalassarche chrysostoma); the feeding and breeding areas of yellow-headed penguin (Eudyptes chrysocome) and penguin macaroni (Eudyptes chrysolophus); and the feeding areas of marine mammals present in the area, such as whales, dolphins and sea lions. In its following articles, it specifies that the PM will be under the tuition of the National Fisheries and Aquaculture Service, and under the oversight of the Ministry of the Environment; that both agencies must draw up a proposal for a general administration plan within one year, and that the provisions contained in this decree will not affect free navigation and the funding areas defined in the respective general management plan, also having to adjust to international treaties and agreements in which Chile is a party and that affect the area decreed. 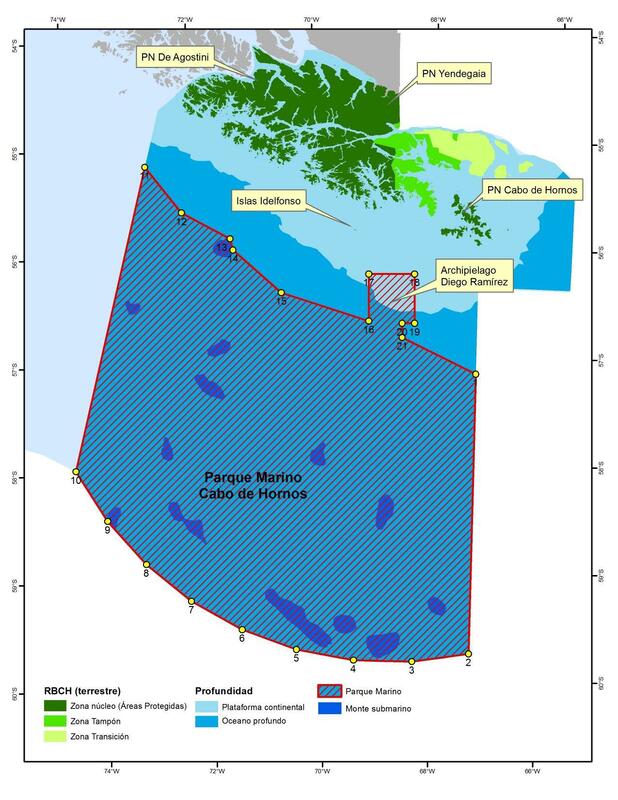 (23 Jan 2018) "After 18 years of scientific research in the Cape Horn Region, the technical report that supported the proposal for the creation of the new marine park was completed by researchers from the University of Magallanes, Institute of Ecology and Biodiversity and Catholic University in Chile and University of North Texas in the USA. The report has offered an academic platform for the creation and implementation of a marine protected area that "marks a milestone in world’s marine conservation." On January 22, 2018, the government of Chile approved the creation of the Diego Ramirez - Drake Passage Marine Park. It will encompass an area of ​​140 thousand km2 of land and marine habitats of the Diego Ramirez archipelago, at the southern end of the continental shelf of the American continent, which provides a unique refuge for the protection of threatened and endangered species like the Grey-headed albatross and southern rockhopper penguins. This decree also grants legal protection to the submerged continental escarpment that dramatically drops into the Drake Passage off the southern coast of Chile, as well as the South Pacific Ocean's most important underwater mountain, Sars Seamount. Dr. Ricardo Rozzi, Director of the Sub-Antarctic Biocultural Conservation Program, who has led the technical-scientific proposal for the creation of the marine park, said that "this event marks a milestone in marine conservation for the country and the planet because it integrates the regional, national, and international scales to harmonize environmental sustainability with economic and social sustainability. Its design does not adversely affect artisanal fishing practices, generates synergy with tourism of special interests, and generates an innovative approach to industrial fishing practices. The establishment of this park represents a milestone since it proposes an innovative model that overcomes dichotomies between conservation and development." The team of researchers and professionals at the Sub-Antarctic Biocultural Conservation Program (SBCP), led by the University of Magallanes in Chile and the University of North Texas in the United States, took particular care to ensure the marine park integrated the conservation of the area with the existing economic activities. The SBC Program is committed to President Bachelet's vision of conservation and fulfillment of long-term research, monitoring the impact of global warming on sub-Antarctic biodiversity. Additionally, it shares the researchers' findings through educational programs and the transfer of knowledge to the local community and the private sector, in order to promote sustainable practices in the Cape Horn region. To this end, the SBC Program has actively collaborated with national and regional government agencies and with the Cape Horn municipality to implement the Management Plan for the Marine Park, which is now the largest marine protected area in southern South America, just north of Antarctica. Also involved are an alliance of Chilean academic centers led by the Institute of Ecology and Biodiversity and the P. Catholic University of Chile, as well as international programs led by the University of North Texas. This consortium has established an academic platform, which will be strengthened by the new Sub-Antarctic Cape Horn Center that will be built in Puerto Williams this year. The Center, along with the declaration of protections for the Diego Ramirez - Drake Passage Marine Park, are examples of advances that will work to successfully overcome challenges associated with the aim of achieving long term sustainability for the sub-Antarctic region and the planet. "This marine park will be implemented in collaboration with the Chilean Navy, the Ministry of National Assets, the Ministry of Environment, the Ministry of Economy, and the Regional Government, integrating a multiple-dimensional concept of sustainability to confront current, challenging times of socio-environmental change global," concluded Rozzi.